IDC's latest report on global mobile phone shipments bring to light some interesting things. Mostly it's the rise of the Chinese company ZTE to the No. 4 spot in global mobile phone shipments, overtaking Apple in the process. This promotion was brought on by the staggering 57.9% jump in growth in shipments compared to last year. Meanwhile, Nokia, Samsung and LG continue to hold on to their No. 1, 2 and 3 spots respectively. ZTE is not the only one experiencing growth. At 23.0%, Samsung saw the second highest growth compared to 2010 while Apple saw a 21.3% growth. Nokia and LG, however, weren't so lucky. 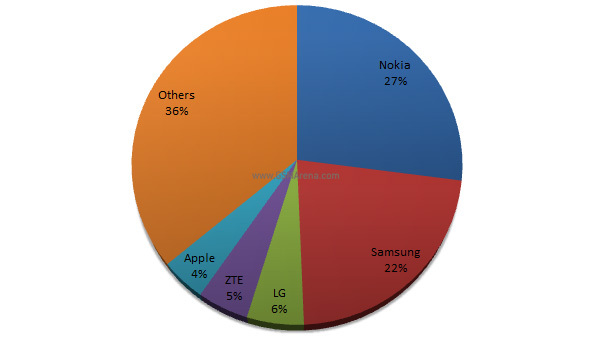 Nokia's market share went down by 3.4% whereas LG saw a massive 25.7% drop in popularity. The entire mobile phone market grew by 12.8%, exceeding IDC's forecast of 9.3%.